Hello Beaders! I hope everyone is staying cool during these Dog Days of Summer! Things are sticky-hot here in little Rhode Island and I know I’m not the only one whose thoughts are beginning to turn to those of a crisp Fall day! Today’s blog is going to focus on PRODUCTS TO SPLURGE ON! These are the fun and/or helpful products that, while they may not be NEEDS, are definitely WANTS. Now and then, if you’re able to, it’s not a bad idea to splurge on one (or two)!! Can you get around not having them? Sure – but your beading-life may be a little easier or exciting with them in it! >>> If you make jewelry that requires the use of pliers, like with wire-worked pieces or even just making simple earrings, it’s likely that you have the basic arsenal of Round Nose pliers, Chain Nose pliers, and Side Wire Cutters. My product to splurge on would be A SECOND PAIR OF CHAIN NOSE PLIERS. Here’s why: Often times when one doesn’t have a second pair of Chain Nose pliers you’re stuck using your Round Nose pliers instead – a good example of this is when you may need to open and close jump rings, which is most easily done with a pair of pliers in each hand. Round Nose pliers simply aren’t the best for this: those ice-cream-cone-shaped jaws, lacking a flat edge, aren’t meant to firmly grip wire for these sorts of tasks. The flat jaws of your Chain Nose pliers will make these tasks much easier AND won’t dent your jump rings (or wire). Dent my wire, Leah? What do you mean? Because Round Nose pliers don’t have a flat edge inside, it means that if you grip something hard enough you’ll end up leaving a dent – which can also become a weak spot in your project! So if it’s your birthday, consider this present to yourself and splurge! >>> Do you do a lot of stringing on mediums such as Soft Flex flexible beading wire? Chances are you likely cut your Soft Flex with either scissors or your Side Wire Cutter. One of the things that’s so great about a high-quality beading wire like Soft Flex is that inside that nylon coating is stainless steel – nice and strong! – but this will dull your scissors and Side Wire Cutters (which are NOT meant for cutting flexible beading wire) over time and render them less precise and helpful. My product to splurge on would be a FLEX WIRE CUTTER. This type of cutter is specifically meant for cutting stringing wires like Soft Flex. It will cut cleanly, sharply, and closely! Note: if you decide to splurge on a pair of Flex Wire Cutters, ONLY use them to cut flexible beading wire. It may be so tempting to use them to get a nice cut on a headpin, but cutting this sort of wire with a Flex Wire Cutter will dull the tool and then it won’t cut your Soft Flex that well over time. (Remember, there is sometimes a very good reason why there are so many types of tools – they each have a specific purpose and mis-using them can damage the tool over time.) So if you hit a milestone in your life and want to give yourself a little gift, consider splurging! >>> If you’re a big seed-beader, like myself, it’s likely that you’ve discovered how wonderful it is to make Peyote stitch bezels around Swarovski Crystal Rivolis. (And if you haven’t discovered this yet – we must remedy this – Check out my video tutorial on the Eureka Crystal Beads YouTube channel to learn how!) Many patterns for doing this call for 2 sizes of beads: Japanese cylinder beads, like size 11/0 Miyuki Delicas, and Japanese size 15/0 round seed beads. Well, as you’ll see in my video tutorial and learn about here, my product to splurge on would be a third size of seed beads to accomplish these beautiful projects: Czech size 15/0 Charlotte seed beads! Not only will these teeny tiny little beads help to pull in your Peyote bezel that much more, creating a more secure home for your Rivoli, but they’ll also add just the nicest metallic touch to your project – and it’s the details of a piece that truly set it apart from the rest. (We sell them in 5 gram packages and believe me when I tell you that they stretch a LONG way over many projects!) So if you’re looking to take your seed beading to the next level, consider splurging! Those are my SPLURGES for now, folks! Stay tuned to my blogs in the future for more Splurge Recommendations! 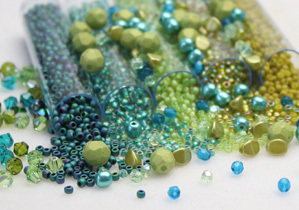 These products, plus thousands more, are available on our website: www.EurekaCrystalBeads.com! Come check us out for yourself to see what we can offer you to enhance your beading and jewelry passion! Until next time! BEad Happy! Previous Post Woven Crystal Chaton Tennis Bracelet! Next Post FREE PATTERN: Pearl Passion bracelet!